data that should be readily available through the publicly funded Western Regional Data Center and the National Climate Data Center, but are not, the first fruit of the labor. This shows the three years in the record where San Francisco had less that ten inches of seasonal rainfall against the average and the 2011 season so far. 1897, 1975, and 2011 so far show a pattern of early season above average rain, a midseason drought, and modest recovery late in the season. The California mid-season dry spell has been noticed by many observers, even in normal years. The first mention I recall was by David Brower in his MANUAL OF SKI MOUNTAINEERING, written in the 1960’s. With the data this can be explored. Interesting the 1897 season had a spike in May. 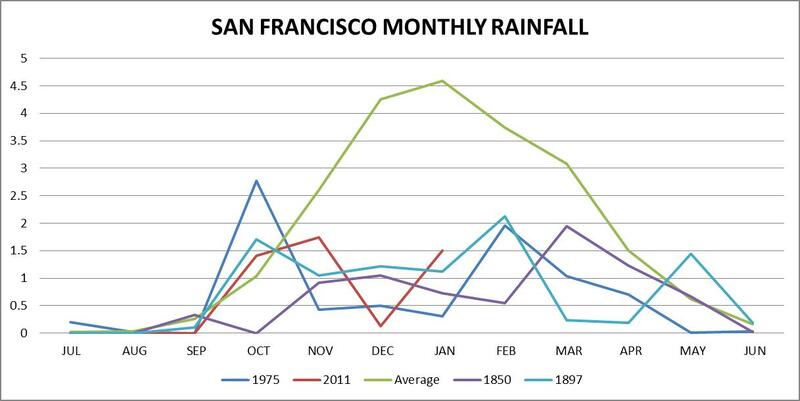 The last three years San Francisco has had above normal rain in May and even into June. Ah, the possibilities. Just try going to the NCDC site! The earth has warmed the last thirty years and that is the only data available. You are invited to view evidence of supposed increase in extreme events, evidence of the icecaps darkening, diminished sea ice. All these things are true and predictable from a rise in global average temperature, but if you want data of extreme events before the warming era, well, those languish undigitized in the National Archives. It would be easier to indulge the gospel according to Jim Hansen so evident at NOAA if they would free the data! This entry was posted in Climate and tagged climate data center, national climate data center, seasonal rainfall. Bookmark the permalink.